From 11th to 14th days of February 2014, Russian and foreign manufacturers and purchasers held a meeting at the key domestic security event – The XIX International Forum Security and Safety Technologies. >>> Train your agents and distributors. >>> The best time: February as a beginning of a new business cycle. >>> A privileged location in the best exhibition venue in Eastern Europe: due to its infrastructure and logistics possibilities the time at SST Moscow is devoted exclusively to business. You and your visitors can get to the show floor in minutes after stepping off the train. 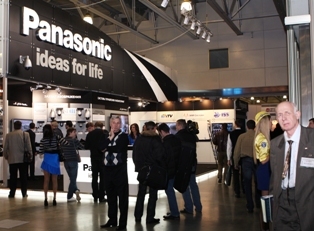 >>> Most attended b2b security event in Russia: 15 000 unique trade visitors (2010). Visitor profile properly reflects the structure of the Russian security market demand. >>> Visitor activity at SST Moscow beats any competition: there are 68% more visitors per exhibitor at SST Moscow than at any other B2B security show in Russia (estimation is based on correlation of number of booths and total number of unique visitors, excluding repeated visits). >>> SST is endorsed and supported by over 20 international and national agencies: Small and Medium Business Administration (Korea); Taiwan External Trade Development Council – Taitra (Taiwan); Committee of State Duma of the Federal Assembly of the Russian Federation for Security; Security Council of the Russian Federation, etc. >>> Strong conference program helps sharpen your market intelligence or even open new markets. >>> A specially designed package offers are aimed at reducing both clients’ costs and headaches, and increase exhibiting experience due to highly professional matchmaking service, logistics assistance, catering service, available lounge facilities, promotion tips and marketing bonuses. All our customers need is to come to the show, devote themselves to business contacts and enjoy the benefits of the show! >>> Reed Exhibitions has been so far for over 6 years a co-organizer of InfoSecurity Russia, the only specialized exhibition for the IT industry in Russia. Having experience and expertise in this area, we can offer IT companies advantageous solutions as participation in one of the Forum’s main section - IT solutions for security market and Information Security Day at SST Moscow. The leading platform for the dialogue between manufacturers, integrators, resellers, assembling and engineering organizations, corporate customers, representatives of small and medium-size business, legislative and executive authorities. Exhibition segmentation: now it is easier both for exhibitors and visitors to find key interests at our show! Strong business program let sharpen ones market intelligence.